Another float trip was scuttled as rain blew the Grand out for the weekend, so I was left scrambling for other alternatives. I checked the flow gauge and started speed dialing. The V was still too muddy, the Rock would be crowded as usual and Conneaut was also too high. That left the Chagrin and I hadn't fished it yet this season. However, I would be fishing solo as others much to their chagrin never catch many fish there. The Chagrin is the eastside equivalent of the Rocky River. It's in the heart of the eastern suburbs of Cleveland and is very popular due to its easy access and much of it runs through metro parks. When it comes to fishing the Chagrin as I call it the "Chag", I prefer to fish high as I leave the lower sections to the Neatherals. Many moons ago, I had no choice but to fish the lower section as the Daniel's Park dam kept the majority of fish from heading upstream. That meant a lot of us had to play nice even though it took ever ounce of self control to not club somebody over the head. There wasn't a lot of spots to fish and I could ring off the names them - Todd's field, soccer field, the power lines, Gilson park and the dome. All of them attracted people like flies to rotting meat. Then in 2004 the dam collapsed and opened new water all the way to Gate's Mills, where another dam held the fish back. That helped ease the crowds as I found the upper sections to be more to my liking - quiet, scenic and entirely devoid of dimwits. The fishing was great during those first couple of years, but gradually the word got out as I started seeing more and more anglers. 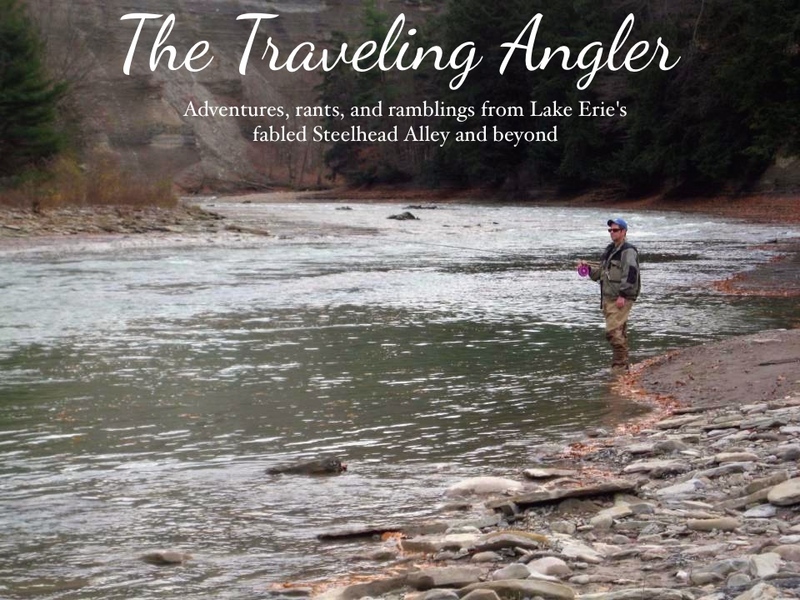 Last year, steelheaders rejoiced when the Gate's Mills dam succumbed and that opened up 8 more miles of water to fish. Ever since the collapse of the dams, I rarely fish north of Daniel's park. Sunday morning, I was the first to roll into the lot and I strolled down the river. This is still my favorite section of the river as it has an excellent combination of long pools, runs and a ton of gravel. It was prime as it could be as the deeper sections were a light green and the flow was perfect. Today, I had both salmon and steelhead eggs. Over the years there has been much debate whether steelhead eggs are better in late winter than salmon eggs. Some people believe that salmon eggs are less effective as steelhead have "lost" the scent because salmon haven't been present for months. I find that hypothesis questionable as I believe steelhead are genetically programmed to eat salmon eggs regardless the time of the year. I've used salmon eggs during the months of March and April and done well. The only reason I use steelhead eggs is because I'm starting to run low on salmon eggs. It was a beautiful morning as I watched a bald eagle fly over and later in the morning I heard an ambulance in the distance that triggered some coyotes to start howling off in the woods. The fishing however, was very tough as it was one here and there. Nothing to write home about either as most of the fish early in the morning were scraggly malnourished small males which I dub as "junk". I kept banging away and walking further upstream. I reached my final destination and it was another small male that looked like he took a major beating from one of the redd bullies. I started back and switched to steelhead eggs, it was the same - one skipper from a small hole and another small male from a tailout. It was getting late in the morning and I had yet to see anybody on the river. I picked off a couple more fish and to no surprise - small males. I was getting annoyed because I fishing near prime spawning areas. There had to be a brute lying in wait somewhere in the deeper water, the "gut" of the pool. That's where those big males love to hide and often throw their weight around whenever others try to muscle in their spot. Then I finally caught a large hen and I wasn't going to toss her back as I was in need of more eggs. She was dark and large and her belly ripe full of eggs. I bleed her and tied the stringer to a log and resumed fishing. I managed a couple of more fish in several spots downstream. It seemed that the fish were not in large groups. As I was getting ready to head back and fish another spot downstream, I lifted the hen and she started to drop eggs. Good thing I was paying attention because if I hadn't all of the eggs would of spilled before I got back to the lot. I shoved a small stick to prevent loosing any eggs. I stowed the fish into the cooler and headed downstream not to far. Unlike the last spot there were 5 anglers fishing in various spots and there was one spot not fished that I knew from past experience held fish. 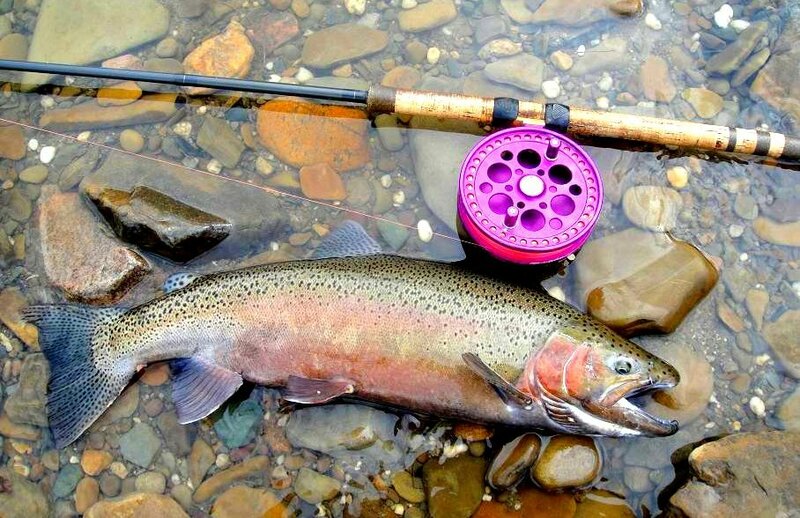 It didn't take long to hook into a fresh male and further down a small skipper fell for a peach steelhead sac. It was only 2:30P.M and I figured the morning crowd was long gone from the lower section. But I had reservations that the fish could of been pounded on earlier. I arrived to see about 8 cars but this section had holes and pools galore. But by then I was frozen to the bone and my stomach was talking me to head out to get something to eat. After fishing for 45 minutes, the combination of both was enough to get me off and head for some chow. Sounds like a great day.Well done.